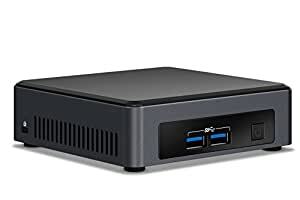 The Intel NUC 7 Business Mini PC (NUC7i5DNKPC) is designed to support small and medium businesses with a need for small and powerful PCs. Built with a 7th Generation Intel Core i5 processor, 256GB NVMe SSD, 8GB DDR4-2133 memory, and Windows 10 Pro, this PC gives you the power your business needs in a PC that fits in the palm of your hand. This NUC includes Intel vPro Technology providing remote manageability and increased security options. Intel HD graphics can power dual 4K monitors for great digital signage, kiosk, or PC experiences. Think you know what small can do? Think again.